Editor’s note: This is the first of a three-part series that takes a closer look at the impact of the natural gas contained in the Marcellus Shale across Pennsylvania. The series will continue next week. In the midst of what has been the worst recession since the Great Depression, there has been an unlikely bright spot in Pennsylvania. Bradford County, according to research by the Northern Tier Regional Planning and Development Commission, led the state in net job growth over the past year, gaining 2,000 jobs from March 2009 to March 2010. It represented a 7.2-percent increase in the county while the state registered a 1.5-percent loss overall during the same period, according to the state Department of Labor and Industry. Frank Thompson, deputy director of the development commission, happened upon the surprising fact after culling through state data. 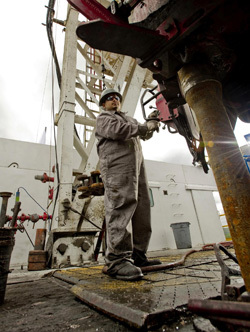 Though it’s hard to quantify, he suspected drilling for natural gas had a lot to do with it. But the Northern Tier is not the only region benefiting from gas drilling. With the industry showing definitive signs of a long-term commitment in the state, the rush is on to create and market helpful technologies. 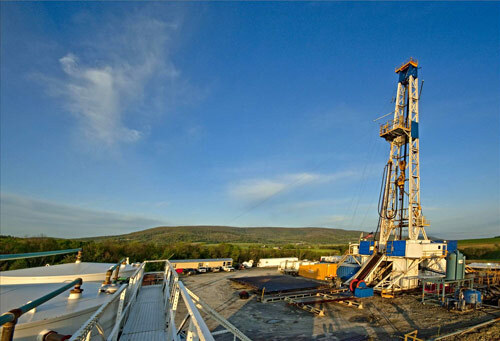 While a recent study by industry group Marcellus Shale Coalition projects ambitious numbers like $2 billion in economic impact and 200,000 jobs by 2020, several Pennsylvania outfits are already making an impact by addressing issues the industry is facing. Frac Biologics Inc., based in Pittsburgh, believes it has a novel approach to treat water used in the drilling and fracturing processes: bacteria that break down heavy metals. Using innovations licensed from the Allegheny General Hospital-affiliated Allegheny-Singer Research Institute, the start-up is marketing the technology as a way to clear out high concentrations of metals such as nickel and strontium that the water can pick up from the rock formations. Such pretreatment has become necessary in areas where used water is treated in traditional sewage plants because those systems often aren’t equipped to filter out increased mineral concentrations. Often, that water is simply diluted with cleaned sewer water and discharged. The state Department of Environmental Protection has found concern with that practice, and drillers are now researching other options. Some drillers, including Range Resources and Chesapeake Energy, are simply reusing their water. By the end of last year, Range was recycling all of its “produced” water, or the liquid that flows up in a well that’s producing gas after the fracturing process. Chesapeake recently announced its Aqua Renew program, an initiative to recycle all of the water the company uses in the Marcellus. Already, that process is reusing 4.3 million gallons a month. The Marcellus is a layer of sedimentary rock about a mile or more underground that underlies much of Pennsylvania and West Virginia and parts of New York, Ohio, Maryland and Virginia. When the shale formed hundreds of millions of years ago, it trapped within its layers organic materials that decomposed into natural gas. Researchers have estimated there are trillions of cubic feet of gas that can be recovered for use in transportation, home heating and electricity production. Scientists have known about this massive reserve for decades, but the technology wasn’t advanced enough to feasibly extract it. 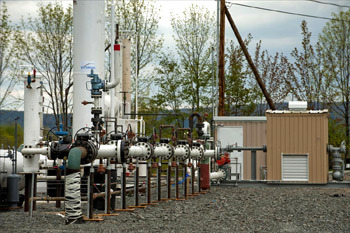 In recent years, production of the Marcellus has become economically attractive thanks to the combination of two techniques: horizontal drilling and hydraulic fracturing. Horizontal drilling allows wellbores to run laterally through the shale layer, reducing the number of wells required while simultaneously increasing the amount of gas that can be extracted from each well. That means fewer disturbances at the surface: Fewer wells require fewer pipelines and other infrastructure. Hydraulic fracturing, developed in the 1940s, uses sand and water under high pressure to expand and extend existing cracks in rock, increasing the amount of gas released per well. Working as a vehicle jack and jack stands might, the water expands the cracks while the particles of sand prop them open. A dozen or so additives enhance the fluid’s effectiveness, from an antibacterial to citric acid for iron-precipitation control. The process has been such a success that the world might now have more gas available than it does oil. In fact, the cleaner-burning resource is so abundant that an equivalent amount of compressed natural gas is about 80 cents less than a gallon of gasoline. The lure of abundant, cheap and more environmentally acceptable fuel produced from Pennsylvanian soil has even enticed marketing businesses to get innovative. A business group calling itself Washington County Energy Partners has secured state and county funding for a campaign to rebrand the county the “Energy Capital of the East.” It plans trade-journal advertisements and other media placements to market its industrial infrastructure of warehouses and offices as a perfect fit for incoming gas-field companies. The campaign launched at the Tri County Oil & Gas Expo on May 7-8. Several of the innovations are innovations only in that they’re returning use to waning technologies. Increased rail transport is chief among them. For the first time in perhaps a decade, a rail terminal in Wyalusing, Bradford County is again being used to offload sand used in the fracturing process. Jim Faffa, the vice president of marketing and sales at Lehigh Railway, told the Wyalusing Rocket-Courier earlier this month that it had just begun bringing loads of sand to the terminal, and the terminal manager expected demand to start at about 20 railcars a week. There are many reports of other rail lines increasing their operations. The Wellsboro & Corning Railroad bought four used locomotives after traffic throughout the Marcellus tripled. Reading & Northern Railroad Co. spent $100,000 to refurbish an outdated terminal near Wilkes-Barre and has plans for more drilling-related improvements that would cost another $500,000. And Norfolk Southern Corp., which recently unveiled new accommodations in Cumberland County for traveling train workers, plans to spend millions of dollars on Pennsylvania infrastructure in the coming years. Back in the Northern Tier, Thompson isn’t surprised at Bradford County’s growth. He says it makes sense since Bradford is, coincidentally, the county with the most gas-well permits. And the job growth is radiating from there. Gov. Ed Rendell announced on May 12 that Schlumberger Technologies Corp. will be opening a 183,000-square-foot, $5.6-million facility in Jefferson County to service the gas industry, maintaining 77 existing jobs and creating 51 full-time jobs over the next three years. While the influx of jobs might not touch every county in the Commonwealth, the influence of the industry’s activities surely will. UGI Penn Natural Gas, part of Valley Forge-based UGI Corp., announced two rate cuts for 2010 that will equal 16.3 percent for its approximately 160,000 customers in 13 counties. Part of that is due to the increased in-state drilling. 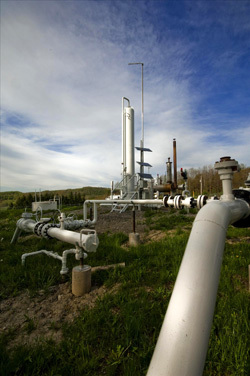 “Shale gas will fundamentally change the market,” UGI spokesman Joe Swope said, speaking to the Scranton Times-Tribune. “It is competitively priced, clean, abundant and produced in the United States, including here in Pennsylvania,” said Peter G. Terranova, UGI PNG’s vice president of marketing and supply. around talking about them when he’s not. Send feedback here. receive Keystone Edge free every week, click here.